It may be too little too late to help the Los Angeles Angels make the postseason, but Shohei Ohtani is returning to the mound. The Angels announced Thursday that Ohtani has been cleared to pitch in the big leagues. Ohtani has been penciled in to start Sunday’s game against the Astros. It will be his first start in nearly three months. Ohtani was shut down in early June after experiencing elbow discomfort. He was ultimately diagnosed with a Grade 2 sprain of his UCL. Such an injury can sometimes require a pitcher to undergo Tommy John surgery. However, the Angels tried a more conservative approach, including platelet-rich plasma injections. That treatment previously worked when Ohtani had a similar injury during his time in Japan. Nearly three months later, Ohtani has been cleared following a 50-pitch simulated game on Monday. The injury to Ohtani was one of many that helped to derail an otherwise promising season for the Angels. Unfortunately, the return of Ohtani will do little to help them in the standings this season. The Angels are currently five games under .500 and more than 15 games out of a playoff spot. Despite being unable to pitch, Ohtani returned from the DL in early July to serve as a DH. The elbow problem had no impact on his ability to hit. On the season, Ohtani is hitting .275 with 15 home runs, helping him post an OPS of .898. After continuing to rehab his pitching elbow, he’s finally ready to resume his role with the Angels as a full-time member of the rotation and a part-time DH. As a hitter, Ohtani has lived up to the hype of a genuine two-way sensation. He was also doing as a pitcher until the elbow problem cropped up. In his first nine big league starts, Ohtani was 4-1 with a 3.10 ERA. He had struck out 61 batters in 49.1 innings with opponents hitting .202 against him. No matter how he performs, it’s important for the Angels to see Ohtani pitch the last month of the season. If he can prove that his elbow his healthy and not hindering his performance, Los Angeles will be able to count on Ohtani being part of their rotation in 2019. Otherwise, the club would have that uncertainty hanging over their head all winter. Obviously, the Angels want to see Ohtani pitch before the season ends. However, they would not put him at risk for further injury if they weren’t convinced he was healthy. 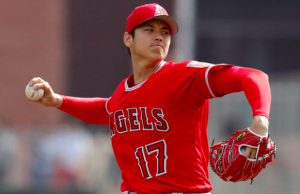 Even if his starts are abbreviated and even if he struggles, just seeing Ohtani on the mound during the last month of the season will be a huge sigh of relief for the Angels. It may not matter much in 2018. But Ohtani’s return at this point is huge for the team’s hopes in 2019.